Scoring one of the resort’s beloved floating cabins requires planning. Scoring a floating cabin at Ross Lake Resort takes a little planning. Many of this year’s visitors will sign up for next year before they depart—which means most cabins are spoken for a year in advance (reservations are not accepted beyond a year). But it’s worth the planning. The best way for a newbie to get in is by getting on the waiting list and being flexible if an opening does turn up. 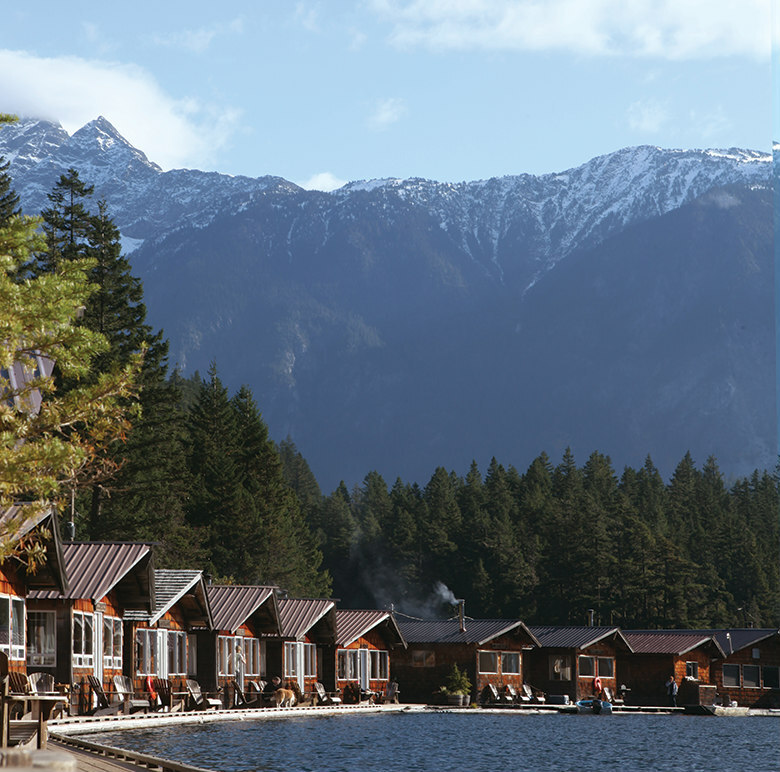 The cabins, strung together in a picturesque line on the west side of Ross Lake, face jagged, snowcapped North Cascades peaks. The accommodations were originally constructed to house workers building Ross Dam beginning in 1937, and then served as base camp for the U.S. Forest Service by the time Jack Kerouac and Gary Snyder slept there on their way up to fire lookout duty in the mid-1950s. 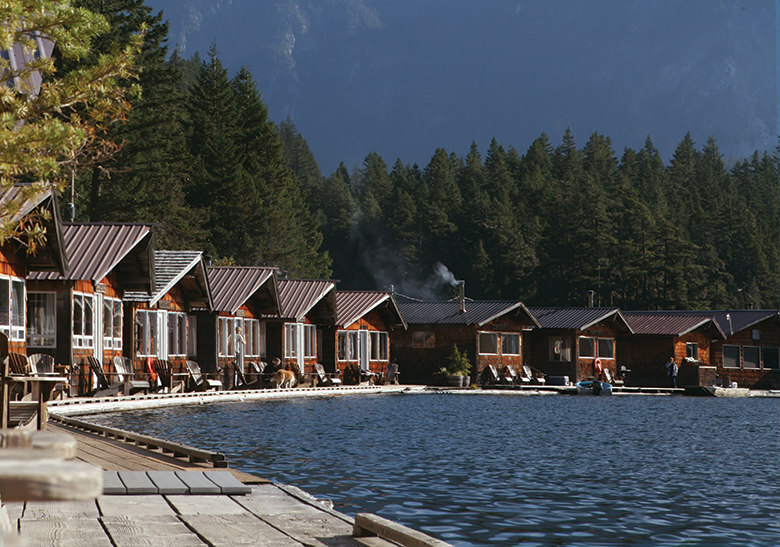 Ross Lake Resort has operated the cabins and an adjoining marina as a floating lodge since those halcyon days. While each of the dozen family cabins and three bunkhouses comes with its own bathroom and kitchen (BYO food—the resort doesn’t sell any), don’t expect anything too luxurious. It’s what’s outside that counts. Set out on foot for the 6-mile hike along Ross Lake to the mouth of raging, tall-timber-choked Big Beaver Creek. Backpackers or long-distance day hikers can venture farther, past the ruins of a 19th-century homestead and into a Tolkienesque ancient forest dominated by millennials—that is, massive western red cedar trees that have been around for 1,000 years or longer. Even better, rent a canoe, kayak or putt-putt motorboat—and maybe a fishing rod—and head out on Ross Lake, where 23 miles of flooded riparian habitat surrounded by undeveloped forest primeval are at your beck and call. Navigate your watercraft into hidden rain forest gorges, shower yourself in the spray of waterfalls cascading down vertiginous cliff walls and poke around small islands more frequently visited by wildlife than humans. Fans of beatnik writers won’t want to miss the switchback-laden yet infinitely rewarding 5-mile hike from the shores of Ross Lake up to the fire lookout atop Desolation Peak, where Jack Kerouac spent nine weeks drying out in solitude during the summer of 1956 (as documented in his books The Dharma Bums and Desolation Angels). The lookout cabin is still staffed during the summer months, and you can get a short tour from the current tenant, whose job these days is as much about meeting the public as it is about scouting for forest fires. And don’t show up without a gift: That banana or half a sandwich might be the freshest food the lookout tender will have had in weeks. At the Desolation Peak fire lookout, ask to see the sheet of paper Jack Kerouac used to roll his own cigarettes or the rope mattress, still in use today. GETTING THERE: A trip to the resort, in the North Cascades, begins with a two-and-a-half-hour drive to Diablo Dam; once you park your vehicle in the Ross Lake Resort parking lot, you’ll board a boat (twice-daily runs, $20/person) that takes you to the end of Diablo Lake and then continue on a resort truck ($8/person) that takes you to Ross Lake. Or park at the Ross Dam trailhead and hike down a steep trail to Ross Dam, where you can pick up a lonely telephone hotline to Ross Lake Resort. Someone will shuttle you via a motorboat ($2/person) to the resort. Either way, getting there is definitely part of the experience. Ross Lake Resort, 206.386.4437; $195–$370.